.This is the Oldenburg Chapel. We travel here every week - usually on Thursday - for District OL reports and training. It is a very nice building - but as with most areas of German towns/cities, very little parking. It is also of note, that only one building we know of in our whole area, has a water fountain/cooler inside. One has to go to the kitchen, get a glass and run some water in order to drink water... We did see ONE in the Hamburg Stake building when we visited there to get our car tires changed to winter wear - this is a usual practice. Brigitte and I met Elder Paul and Sister Paul who are from Frankfurt. They are on a mission to teach Institute in our Zone. Br Paul was recently released as an Area 70. They have also lived in Moscow, Russia for 3 years. It is very nice to work with another Senior Couple, especially a couple with such a rich experience to share with us. On 17Sep we drove to Hannover for a Mission Training Meeting. It is about 2.5 hour drive, along with meetings and the drive back, it was a long day. No pics...... Next time will also work. In any case, here is a picture of our OL group picture taken at this conference. You can also look at the www.germanyberlinmission2012-15.blogspot.com if you are of a mind to look at all the people involved with the Berlin Mission effort and the areas they serve. This was not the whole enchilada, but a portion of the whole mission. Left and below are pictures from our Church Bldg - Gemeinde Haus_WHV. It is a converted house and everyone is looking forward to growing quickly so we can leverage a REAL chapel building with only one floor. A basement is fine, but things are really cramped - good for closeness:-) The bathroom is up a flight of stairs and one brother is in a wheel chair which makes that impossible. Interesting what has to be done at times to support the needs of so many varied conditions. These pics are from early October. The WHV Postamt - Post Office. There is also a Postbank - a Bank that is also part of the government system, although there are many other banks available. Across the plaza, to the right of the post office, is the WHV Rathaus - City Hall. It looks officious with the clock tower and the size of it. Here are a couple of pics of some nicer apartment buildings in WHV. We plan to get more to capture the flavor of the individual homes, and the stores, and the 'pizzarias' (Turkish type). As we said, it gets interesting to adapt to many changes. Many of them are very nice and fun to experience. Brigitte and I put these maps together to get a picture of where the Branch members live in the wide area of WHV. To the left - the green sticker - is where Sr Stadler lives. She is alone and lives on an island. She works hard and make enough during the tourist season to hold her together. On the right is a better pic of downtown & the LDS Church bldg. is just to the left of the blue 11. It got interesting as I brought a power converter with me in anticipation of having to convert from 220V DC to 110V AC in Germany. However, I bought this one some time ago and it did not have a 3-prong plug receptacle. This would not work for my computer, and I refused to cut off the ground prong to allow the plug to work. So I set about trying to find a power converter in WHV. Bigger places such as Media Markt - something like Best Buy = did not carry it as there was no demand. There was nowhere else in town that could be found either. I asked our daughter Laurie to got to Best Buy and pick a couple of them up and send them to me in haste regardless of shipping costs. She was also able to include my old CD of LDS scriptures that I really like and can copy, etc. to put together talks, lessons, etc. I don't seem to be able to do that with my PC from the currently available online scriptures. Another glitch - the LDS translation of the Bible into German is NOT allowed in Germany. So we had to set about getting German Bibel downloads - which are nice, but it gets interesting with differences in translation and concepts of the translators vis a vis what we are trying to teach. It just takes a little more time to ensure any delay from differences are clearly understood and easy to explain. Meantime - back to the power converters. Laurie jumped right on it and sent me two converters with adapter plugs that Best Buy folks told her would work very well. They were to arrive on 30Sep. The pkg did not arrive. By 3Oct we started trying to track it down and the tracking number of USPS indicated that the pkg arrived in WHV on the 27th. We went to the Post Office and inquired - long waiting lines are no different here. The lady went in the back and came back in a few minutes and said there is nothing there and without a German tracking number, she would be unable to help us. OK - so what now??? We were advised to check with the WHV Zollamt (Customs Dept). We Googled it and called the number and were told we would have ot wait until the Post Office/DHL left us a notice advising us that the pkg was ready for pickup. WAIT! We had to wait until Monday as it was too late on Saturday as government offices and many businesses close up at 2PM on Saturday to allow a longer time for the weekend. Not like the weekend in USA being a very busy day for customer service, buying and selling. This is the Customs Office to the right. They were not the most polite folks we have met yet, but we did meet an official who came to talk with us about how we were doing in WHV as missionaries. He is in leadership for the WHV Jehovah's Witnesses and was a very pleasant fellow. We had a nice chat. We had to wait until we took our mission car to Hamburg to get the winter tires put on - as mentioned above. We were advised to go to SATURN (at first I thought that was a very long way to go and didn't know if Orbiter would be available). SATURN is an all purpose - we have everything, or you don't need it - store. After lunch with some other Senior Couples who were at the meeting - we went to a Chinese restaurant and order in German :-) - we found Saturn AND the right power converter!! YEAH!!!! = It was an additional $40, but at that point I was beyond caring - I needed a power converter!! Here are some pics from the Hamburg trip on 10/10 - Laurie's birthday as a matter of fact. 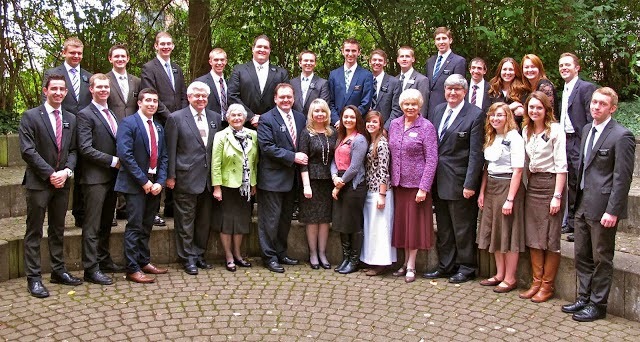 Elder & Sister Beesley from Mission Berlin. He takes care of fleet and apartments and she is logistics. Elder & Sister Marggetts - Young Singles in Kiel. Elder & Sister Nuttall - Institute Hamburg. Note the sign on the column behind us. The sign is a recognition of the 100th year celebration of the church in Hamburg as of 1957, This would have been within the first decade of the LDS pioneers arriving into the SLC valley. The History of the Church for this area would be interesting. Does anyone remember Konrad Adenauer who was Germany's Chancellor after WWII? Here is a street named after him. The main Bahnhof in Hamburg. The Saturn store was in this area. This building does not seem to know if it wants to go LEFT or RIGHT? Hamburger apartment building. We wonder if the Hamburgers are as good as the Frankfurters in Frankfurt. A green field in Germany on the way home from Hamburg - The greens here are very different than what we have seen in the states. May be from happy cows, etc.??? After all this travelling and the FUN experiences of adjusting to a different culture, we are happy that our shower works so well. The hot water is supplied by a different system than we use in USA. We had that type of system put into our home in Lantana when we built it. It heats the water as we use it and it never runs out. Here, the systems are situation close to the point of use, so little water must run until hot comes out. One has to be ready, as it takes only a few seconds for the hot water to start coming thru. Another adjustment was SOAP - which is Irish Spring and which is German Generic?? ?